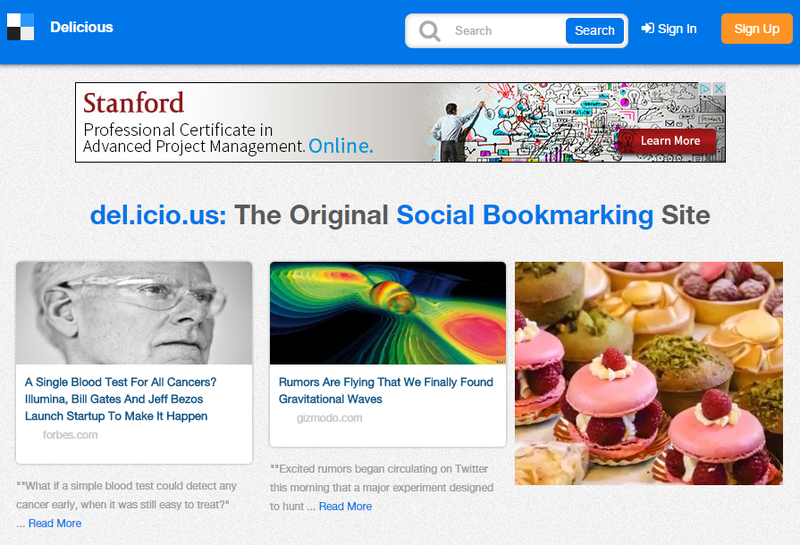 Once upon a time (maybe around 2004), the social bookmarking service Delicious was the hottest thing on the web. It hit all the right buzzwords of the time (collaborative tagging, folksonomy, AJAX), but like so many other services, Yahoo simply let it whither after it acquired the company in 2005. Since then, it has changed owners twice — first to AVOS, a company owned by the founders of YouTube, and then in 2014 to Science Inc.
Update: We managed to get in touch with Delicious’s new CEO Tony Aly and have updated this post with his comments. Just like YouTube and AVOS, Science also clearly didn’t quite know what to do with this living fossil of a web service. According to an update on the Delicious blog, the service is now managed by Delicious Media — a new alliance between Domainersuite and Science Inc. Domainersuite founder Tony Aly is now Delicious Media’s CEO. “Science has transitioned control of Delicious to our new entity so that my team and I can dedicate ourselves to the long-term success and stability of this wonderful, useful, trailblazing site,” Aly writes in the announcement, which was quietly published yesterday. To do all of this, the new owners are rolling back many of the changes the latest set of owners made to the site. Turns out, the former owners left the lights on, though, and kept the old version up and running under previous.delicious.com, so reverting back to that old version should be pretty straightforward. In a far weirder move, though, the site is also moving back to its original URL: del.icio.us. That’s the domain Delicious launched with, but it later moved to the easier-to-remember Delicious.com. Aly says this move is “one of the terms of the transition,” which makes me think the plan here is to sell the delicious.com domain to the highest bidder at some point. As Aly tells me, Science remains in control of the Delicious.com domain name. On a more positive note, at least for die-hard Delicious del.icio.us fans, Aly also promises to bring back Stacks. This was a feature that allowed users to collaborate on link collections. AVOS killed this in 2012, about a year after it acquired the site from Yahoo. None of this immediately makes me think that its best days are still ahead, to be honest, but let’s give the new owners the benefit of the doubt for the time being. We reached out to Aly, but haven’t heard back. We will update this post once we hear more.